We wanted to do something fun for the Thanksgiving holiday. A little challenge that would hopefully offer a bit of stress relief and that would give you an opportunity to reward yourself for surviving the biggest shopping weekend in the US. 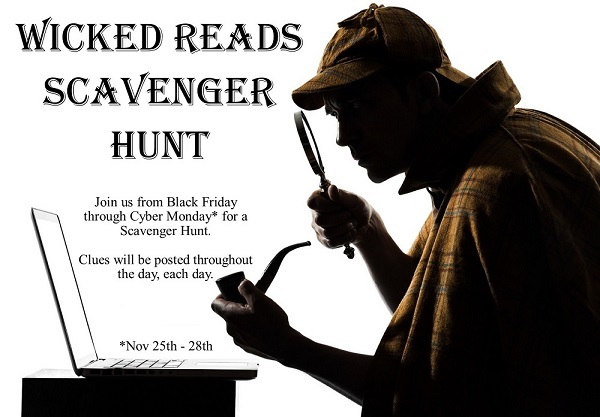 From Black Friday (November 25th at 12:01 am EST) through Cyber Monday (November 28th at 11:59 pm EST), Wicked Reads is hosting a SCAVENGER HUNT!!! Each day we will post 3 to 5 clues. The posting times will vary. The answers can be found by searching the Wicked Reads blog. That's right folks, this is a book & blog related scavenger hunt. A Rafflecopter has been set up for hunters to submit their answers. This has been done so that no one can cheat off of your hard work. Each clue will be posted on our Wicked Reads Facebook page. We will try to post the clues to our Twitter account, @WycEdReader, also. When the clue goes live, it will be added to the Rafflecopter on the Scavenger Hunt page. Do NOT comment on the Facebook post. Persons who post their answers on the Facebook clue post will be disqualified. Should you decide to work with a partner, do it via PM, email, or text messaging. But understand, only the person’s name who is drawn is eligible for the prize. It will NOT be split up between partners. The prizes are Dreamspinner Press $$ credited to your DSP account. Because this is a Scavenger Hunt, you must qualify to be entered into each level's drawing. 3rd Place – 50% of the clues solved correctly. 2nd Place – 75% of the clues solved correctly. 1st Place – 100%* of the clues solved correctly. *Note: If no one submits 100% of the answers correct, then the next highest percentage attained will be designated as the qualifier. Winners will be chosen randomly from everyone who qualifies for the level. Winners will need to have or set up an account with Dreamspinner Press so that their prize can be credited to their account. The Scavenger Hunt is open to International followers as well, but the DSP Dollars are credited as USD. All of the clues & answers will be about Dreamspinner Press and Harmony Ink ebooks and audiobooks. then chances are good that your answer is incorrect and you need to continue hunting. The search bar at the upper left side of the page is your friend. If you’re accessing the site via a mobile device, use the link at the bottom of the page to request the Web Version of the page. Once the Rafflecopter goes live, any additional info will be added to this section. Because the Scavenger Hunt is open to International residents, we realized we needed to leave the Rafflecopter open long enough to allow them to see the final clues & submit their answers. As such, we decided to do a Bonus Clue. The purpose of the Bonus Clue is to give those players who have hunted down every clue an extra chance to hit 100%. So if you've answered all 20 clues and get one wrong, the Bonus question will be substituted for a wrong answer (assuming you get it correct). If you only answer 19 question, the Bonus question does not help you at all. Thanks to all who have played and the winner will be announced later this week, once all of the answers have been sorted, verified, and each level's winner randomly chosen.